IL-7 plays important roles in development and homeostatic proliferation of lymphocytes. IL-7 uses a receptor composed of IL-7Rα (CD127) and the common γ-chain (CD132) to transmit its signal. It has been unknown how CD127 is regulated during Th cell differentiation to the B cell-helping T cell lineage. In this study, we report that loss of CD127 defines terminally differentiated B cell-helping effector T cells in human tonsils. Although naive CD4+ T cells uniformly express CD127, the memory/effector (non-FOXP3+) CD4+ T cells are divided into CD127+ and CD127− cells. The CD127− T cells are exclusively localized within the germinal centers where B cells become plasma and memory B cells, whereas CD127+ T cells are found in T cell areas and the area surrounding B cell follicles. Consistently, the CD127− T cells highly express the B cell zone homing receptor CXCR5 with concomitant loss of CCR7. Compared with CD127+ memory T cells, CD127− T cells have considerably shorter telomeres, do not proliferate in response to IL-7, and are prone to cell death. The CD127− T cells produce a large amount of the B cell follicle-forming chemokine CXCL13 upon stimulation with B cells and Ags. Most importantly, they are highly efficient in helping B cells produce Igs of all isotypes in a manner dependent on CD40L and ICOS and inducing activation-induced cytidine deaminase and Ig class switch recombination. The selective loss of CD127 on the B cell-helping effector T cells would have implications in regulation and termination of Ig responses. Interleukin-7 is a cytokine important for both development and peripheral expansion of T cells (1, 2). IL-7 also regulates the survival and generation of memory CD4+ T cells (3). It is also important for B cell development in bone marrow (1, 2, 4). IL-7 can support low-affinity Ag-induced proliferation and, therefore, is important for homeostatic proliferation of T cells (5, 6). IL-7 has a costimulatory effect on T cells by enhancing their proliferation and cytokine production (7). IL-7 can suppress the programmed cell death of mature T cells (8, 9), in part, through up-regulation of B cell leukemia/lymphoma 2 (BCL-2).3It can also enhance the lytic activity of classical CD8+ T cells (10), NKT cells (11), and γδ T cells (12). The receptor for IL-7 is composed of IL-7Rα/CD127 and the common cytokine receptor γ-chain (CD132). Additionally, IL-7Rα serves as a subunit of the thymic stromal lymphopoietin receptor complex (13). IL-7Rα is highly expressed by thymic CD4−CD8− double-negative T cells but it is down-regulated on double-positive T cells (14). Expression of IL-7Rα is regained at the single-positive stage, and, thus, it is uniformly expressed by naive T cells in the periphery. CD4+, and CD8+, memory T cells express IL-7Rα and require IL-7 for long-term survival (3). It has been reported that the IL-7α expression is selectively lost on many CD8+ effector T cells and FoxP3+ regulatory T cells (15, 16, 17, 18, 19). B cells undergo functional maturation to become plasma B cells in secondary lymphoid tissues. B cells require the help from T cells to fully differentiate into plasma B cells producing class-switched Igs such as IgG1–4, IgA1&2, and IgE in germinal centers (GC) (20). It is thought that there are certain effector T cells that are dedicated for helping B cells and induce class switch recombination for production of Abs. Appropriate candidates for such T cells have been described before in human tonsils. Several surface markers, such as CD57, CXCR5, and ICOS, have been used to identify the B cell-helping T cells (21, 22, 23, 24). Although these markers are useful, they are limited in specifically identifying such effector T cells. CD57 is expressed by some, but not all, B cell-helping (or GC) T cells (21). CXCR5 and ICOS are expressed by not only follicular, but also many interfollicular, T cells (24). In this study, we report that the CD4+ T cells that are negative for IL-7Rα are terminally differentiated B cell-helping effector T cells in human tonsils, a B cell-enriched lymphoid tissue. We found that IL-7Rα/CD127 can serve as a useful surface marker in identification of terminally differentiated B cell-helping effector T cells in human secondary lymphoid tissues. This allowed us to determine the previously unknown cellular features of these T cells such as their unresponsiveness to IL-7, short telomeres, nonproliferative and proapoptotic nature, high expression of CXCR5 but reduced expression of CCR7 and CD62L, high expression of effector T cell adhesion molecules, and specific localization in GCs. Consistently, they are highly efficient in helping B cells and inducing Ig class switch recombination. The implications of these findings in regulation of humoral immune responses are discussed. Tonsil mononuclear cells were prepared by density gradient centrifuge on Histopaque 1077 (Sigma-Aldrich). Tonsil specimens were obtained from young patients (<15 years) undergoing tonsillectomy to relieve obstruction of respiratory passages and improve drainage of the middle ear. T cells were enriched from the mononuclear cells by a sheep RBC rosetting method (25). CD4+ T cells were isolated by the CD4+ T cell isolation kit (Miltenyi Biotec). CD25+FOXP3+ T cells were removed with anti-CD25/magnetic beads to obtain CD4+CD25− cells. Naive and memory CD4+ T cells were isolated by depleting CD45RO+ and CD45RA+ cells, respectively. CD127− T cells were isolated from CD4+CD25−CD45RA− cells by depleting CD127+ T cells with MACS twice. CD25−CD127+ memory T cells were isolated by positive selection of CD127+ cells from the CD4+CD25−CD45RA− cells with MACS. Small numbers of contaminating non-CD4+ cells were further removed by positively selecting CD4+ T cells to isolate highly pure CD4+CD25−CD127− T cells (purity ∼95%) with minimal contamination with FOXP3+ T cells (<2%). Total CD19+ B cells were isolated by depleting T cells with a sheep RBC rosetting method (25). Naive B cells were further isolated from the total B cells by positively selecting IgD+ cells (purity >99%), and CD19+CD38+IgD− GC B cells (purity ∼94%) were isolated by depleting IgD+ cells and positively selecting CD38+ cells as described previously (25). The use of human tonsils for this study has been approved by the Institutional Review Board at Purdue University. Detection of chemokine receptors and other surface Ags was performed as described previously (26). CD4+CD25− T cells were stained with Abs to CCR2 (48607.121), CCR4 (clone 205410), CCR5 (45531.111), CCR6 (53103.111), CCR7 (150503), CXCR3 (49801.111), CXCR4 (44717.111), CXCR5 (51505.111), CXCR6 (56811.111), or mouse control IgG2b (Caltag Laboratories). The Abs to the chemokine receptors were purchased from R&D Systems or BD Biosciences. Cells were further stained with a biotinylated horse anti-mouse IgG (H+L) Ab (Vector Laboratories) for 20 min, followed by staining with PerCP-streptavidin (BD Biosciences) and Abs to CD127 (hIL-7R-M21), CD45RO (UCHL1), and CD4 (RPA-T4). Stained cells were acquired on a FACSCalibur. The intracellular staining for cytokine production was performed as described previously (21). Frozen sections of tonsils were cold acetone-fixed and stained with monoclonal anti-human CD127 (BioRDR5; eBioscience) and then with biotin-conjugated horse-anti-mouse IgG (H+L; Vector Laboratories). The sections were further stained with PE-conjugated streptavidin (eBioscience). After blocking with 10% mouse serum, the sections were stained with Abs to CD57 (TB01), ICOS (DX29), and/or CD4 (RPA-T4). The slides were further stained with Hoechst 33432. Slides were examined with a Nikon E400 microscope equipped with epifluorescence. Chemotaxis was performed as described previously (25). Human CCL19 and CXCL13 proteins were purchased from R&D Systems. A total of 5 × 105 CD4+CD25− T cells in 100 μl of chemotaxis medium (RPMI 1640 with 0.5% BSA) was placed in each transwell insert (5 μm pore, 24-well format; Corning Costar), and the transwell inserts were placed in 24-well plates containing 600 μl of chemotaxis medium (RPMI 1640 with 0.5% BSA) with optimal concentrations of CCL19 (1000 ng/ml) or CXCL13 (1500 ng/ml). Cells were allowed to migrate for 3 h in a 5% CO2 incubator at 37°C. After chemotaxis, the cells that migrated to the lower chambers were harvested and stained with Abs to CD4 (RPA-T4), CD127 (hIL-7R-M21), and CD45RO (UCHL1). Stained cells were acquired on a FACSCalibur, and specific percent migration after subtraction of the background migration was calculated. For proliferation, sorted T cells were cocultured in U-bottom 96-well plates for 5 days at indicated ratios in the presence of PHA (5 μg/ml), anti-CD3 (5 μg/ml, immobilized) and anti-CD28 (2 μg/ml, soluble), or equal numbers of syngeneic CD19+ B cells with or without staphylococcal enterotoxin B (SEB; 1 μg/ml; Sigma-Aldrich). Cells were further incubated with 1 μCi/well [3H]thymidine for 8 h, and [3H]thymidine incorporation was measured by a β-scintillation counter (Top Count Microplate Scintillation Counter; Packard Instrument). For the cell survival assay, isolated T cell subsets were cultured for 5 days in RPMI 1640/10% FBS and then stained with 7-aminoactinomycin D (7-AAD; final 0.5 μg/ml) immediately before flow cytometric detection of dead (7-AAD+ or forward scatter low) cells. The 5-day-old culture medium was examined for CXCL13 production with an anti-hCXCL13 ELISA kit (R&D Systems). The telomere length of sorted naive, memory CD127+, and CD127− T cells was measured using the Telomere PNA/FITC kit for flow cytometry (DakoCytomation). Briefly, T cells were washed in PBS and resuspended in 300 μl of hybridization solution containing 70% formamide with FITC-conjugated telomere peptide nucleic acid probe. The cells were heated for 10 min at 82°C for denaturation of DNA. Hybridization was performed overnight at room temperature. Cells were heated for 10 min at 40°C and washed with DakoCytomation washing solution twice. Samples were analyzed by flow cytometry. Sorted T cells and B cells (105 each) were cultured in each well of 48-well plates in RPMI 1640 medium supplemented with 10% FBS, gentamicin, streptomycin, and penicillin. When indicated, NaN3-free mAbs to ICOS (ANC6C6-A3) and/or CD40L (24, 25, 26, 27, 28, 29, 30, 31 ; both obtained from Ancell) or control Abs (mouse IgG1, 11711.11; R&D Systems) were added at 10 μg/ml to neutralize the molecules. For class switch recombination, SEB (1 μg/ml) was added to provide a cognate T-B cell activation signal. Cells were incubated in a 5% CO2 incubator at 37°C for 5 days. The Igs produced from the B cells were detected by ELISA. Activation-induced cytidine deaminase (AID), Ig transcripts, and β-actin were amplified by PCR as previously described (27). Digestion circularization-PCR was performed as previously described using PCR primers for γ3 and α1/2 (28). Total RNA was extracted with TRIzol reagent (Invitrogen Life Technologies) from the sorted T cells and was reverse transcribed into cDNAs with the SuperScript First-Strand Synthesis System for RT-PCR (Invitrogen Life Technologies) according to the manufacturer’s protocol. The primers used were 5′-ttg cgg cac atg tca taa gtg-3′ (forward) and 5′-gcc aaa gga cgt gaa gcc a-3′ (reverse) for CD40L; 5′-atg aag tca ggc ctc tgg taa ttt-3′ and 5′-cag aac ttc agc tgg caa caa-3′ for ICOS; 5′-gca ttc agt gac ctg aca tcc-3′ and 5′-cat ttc cga ctg aag agt gag-3′ for Bcl-xL; 5′-cct tct ttg agt tcg gtg gg-3′ and 5′-gcc tct gtt tga ttt ctc ctg g-3′ for BCL-2; 5′-atc tct cgg tac ctt cgg gag c-3′ and 5′-cct gat gcc acc ttc tag gtc c-3′ for myeloid cell leukemia (MCL-1), and 5′-aga aga gct acg agc tgc ctg ac-3′ and 5′-tac tcc tgc ttg ctg atc cac at-3′ for β-actin. The cDNA templates were serially diluted (×5, ×25, and ×125) for a semiquantitative PCR (30 cycles of denaturation at 94°C, annealing at 55°C, and extension at 72°C; 30 s for each step; 25 cycles for β-actin). BCL-2 and MCL-1 were amplified by a touch-down PCR method (5 cycles of 94°C, 64°C, and 72°C progressing toward 60°C with equal decrements over the five cycles; and followed by additional 30 cycles of 94°C, 59°C, and 72°C). The PCR products were separated on 1.5% agarose gels and documented with a Kodak imaging system (EDAS 290). The Student paired two-tailed t test was used for statistical analysis when indicated. Values of p ≤ 0.05 were considered significant. It has been reported that CD25+FOXP3+ T cells in peripheral blood (PB) are CD127low/− (17, 18, 19). We found that this is true also for most CD4+CD25+ (FOXP3+) T cells in tonsils and many CD4+CD25− cells (Fig. 1⇓A). 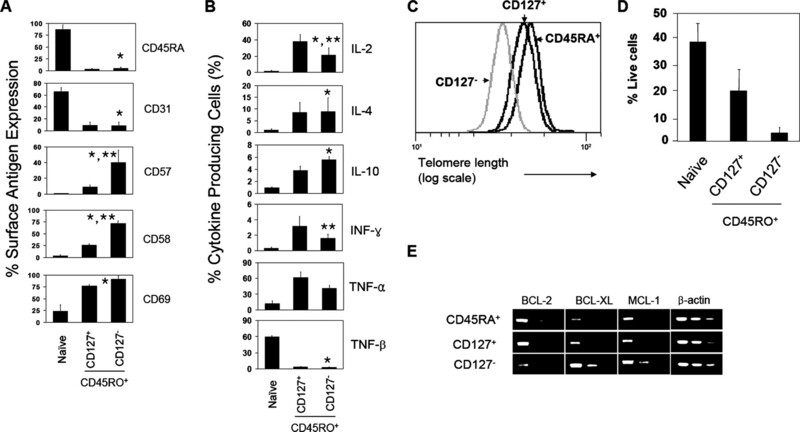 CD4+CD25−CD45RO+ T cells were almost equally divided into CD127+ and CD127− T cells (Fig. 1⇓B). Reciprocal expression of the two chemokine receptors CCR7 and CXCR5 determines the localization of T cells within secondary lymphoid tissues (29). The CD4+CD25−CD127− T cells (hereafter called “CD4+ CD127− T cells”) highly express CXCR5 but express CCR7 at reduced levels (Fig. 1⇓B). Expression of the lymph node-homing selectin CD62L was also decreased on the CD4+CD127− T cells. The CD127+CD45RO+ T cells, when compared with CD127− CD45RO+ T cells, express CXCR5 at lower levels but CCR7 at higher levels. 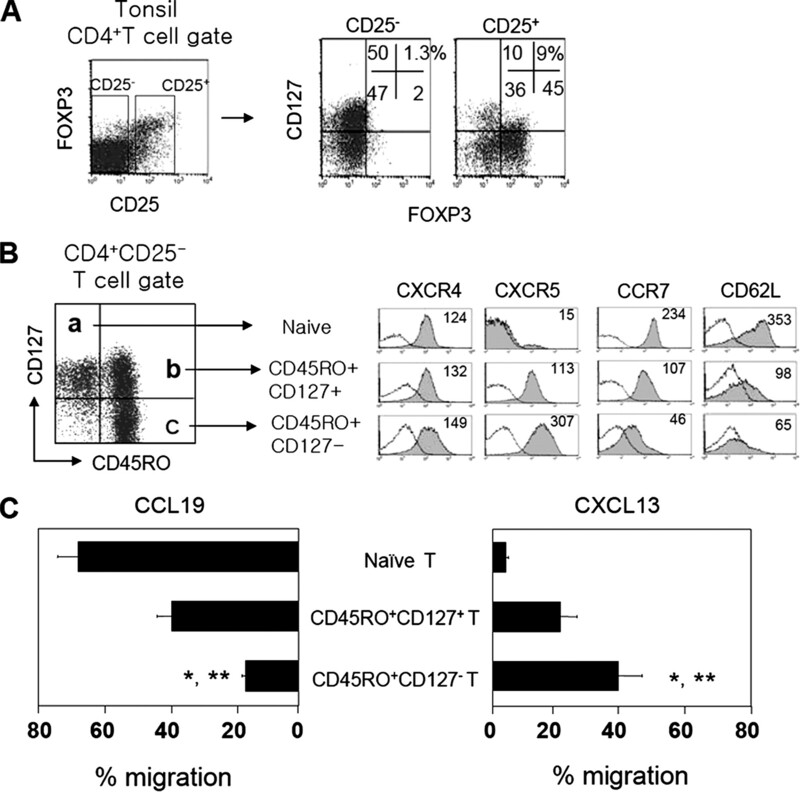 As expected, CD127+CD45RO− naive T cells highly express CCR7 but do not express CXCR5. Consistently, CD127−CD45RO+ T cells were highly responsive to CXCL13 (the CXCR5 ligand), while CD45RO− naive T cells were highly responsive to CCL19 (a CCR7 ligand) (Fig. 1⇓C). In comparison, CD127+CD45RO+ T cells were moderately responsive to both CCL19 and CXCL13. Otherwise, the expression of other chemokine receptors by the CD4+CD127− and CD127+ T cell subsets was similar overall (Table I⇓). The presence of non-FOXP3+CD4+CD127− T cells in tonsils. A, Many CD4+CD25− (FOXP3−) T cells are CD127 low/−. B, FACS dot plots for the tonsil CD4+CD25− T cell subsets defined by CD45RO and CD127. Expression of CXCR4, CXCR5, CCR7, and CD62L by the three CD4+ T cell subsets was examined. Mean fluorescent intensity is shown to indicate the expression levels. C, Chemotaxis of the three cell subsets to indicated chemokines (error bars are SEM of four independent experiments). All experiments were performed at least three times. Representative (A and B) or combined data (C) are shown. ∗, Significant differences from naive (∗) or CD127+ cells (∗∗). We performed immunohistochemistry experiments to determine the microenvironmental localization of CD4+CD127+ and CD4+CD127− T cells. The CD127+ T cells were almost exclusively localized in the T cell zones. In contrast, the CD127− T cells were localized within the GC areas (marked by the CD57 expression, Fig. 2⇓A). In contrast, the costimulation receptor ICOS was expressed by the T cells in not only GCs but also in the T cell areas, and, thus, its expression is not a good indicator for GC-T cells. One of the key indicators of GC-T cells is the ability to produce the B cell zone chemokine CXCL13 (30). We isolated the three CD4+ T cell subsets at high purities to examine the CXCL13 production capacity of the T cells (Fig. 2⇓B). It was the CD4+CD127− T cells that almost exclusively produced CXCL13 among the three T cell subsets (Fig. 2⇓C). Spontaneous production of CXCL13 by the CD4+CD127− T cells in the absence of APCs or activators was hardly detectable by ELISA (Fig. 2⇓D). Activation with T cell activators or coculture with syngeneic B cells greatly enhanced the production rates of CXCL13 from the CD4+CD127− T cells (Fig. 2⇓D). CD4+CD127− T cells were comparable to the previously characterized CD57+ GC-T cells (30) in the CXCL13 production capacity (Fig. 2⇓, D and E). Coengagement of CD4+CD127− T cells and B cells by the superantigen SEB greatly increased the production capacity of CD4+CD127− T cells (Fig. 2⇓E). The CD4+CD127− T cells are present specifically in GCs and produce the follicle-homing chemokine CXCL13. A, Immunohistochemistry data. Frozen tonsil sections were stained with Hoechst 33432 and Abs to CD127, CD57, CD4, and/or ICOS. B, Isolation of the three CD4+ T cell subsets for functional characterization. C, The three CD4+ T cell subsets differ in their CXCL13 production capacity. The T cell subsets were cultured with PHA for 5 days and the culture medium was examined for CXCL13 by ELISA. D, The CD4+CD127− T cells were cultured alone or stimulated with PHA or syngeneic B cells. E, Engagement of the CD4+CD127− T cells and B cells with SEB (a superantigen) greatly enhances the CXCL13 production by the CD127− cells. All experiments were performed at least three times. Representative (A–C) or combined (D and E) data are shown (error bars are the differences of duplicated ELISA). ∗, Barely detectable. We examined the expression of a number of naive or memory T cell-associated Ags by the CD4+CD127− T cells to more closely characterize these T cells. CD45RA (a naive T cell marker) and CD31 (platelet endothelial cell adhesion molecule-1, a naive T cell-specific receptor) (31) are not expressed by the CD4+CD127− T cells (Fig. 3⇓A). In contrast, CD57 (an Ag expressed by a GC T cell subset), CD58 (LFA-3, an adhesion molecule and the ligand of CD2), and CD69 (an early activation Ag and suppressor of sphingosine 1-phosphate receptor) (32) were expressed by many CD4+CD127− T cells. Thus, the CD4+CD127− T cells express the cell surface molecules associated with activated memory/effector T cells trapped deep within tissues. Only a few CD4+CD127− T cells were able to produce IL-4, IL-10, and IFN-γ (Fig. 3⇓B). CD4+CD127− T cells had somewhat lower capacities in production of IL-2, IFN-γ, and TNF-α, compared with the CD127+CD45RO+ T cells. The CD4+CD127− T cells were not able to produce TNF-β/lymphotoxin-α (a cytokine specifically produced by naive T cells in humans) in a manner similar to the CD4+CD127+ cells. Thus, these data suggest that CD4+CD127− T cells are activated and largely nonpolarized tissue-residing T cells. The Ag expression and cellular phenotype of the CD4+CD127− T cells. A, Expression of surface Ags by the three tonsil CD4+ T cell subsets. B, Intracellular cytokine expression capacity upon activation with PMA and ionomycin. Significant differences from naive (∗) or memory CD127+ T cells (∗∗) are shown. C, The CD4+CD127− T cells have short telomeres. The telomere length of the three tonsil CD4+ T cell subsets was measured. D, T cell survival rates after 5 days in culture in RPMI 1640/10% FBS without any stimulation. Error bars are the differences of duplicated measurements. E, Expression of BCL-2-related molecules in the three T cell subsets. RT-PCR was performed on freshly isolated T cells. The cDNA templates were serially diluted (×5, ×25, and × 125). All experiments were performed at least three times, and combined (A and B) or representative (C–E) data are shown. Every chromosome has several thousand repeats of hexameric sequences at both ends, which are called telomeres (33). Telomeres become shorter by 50–100 bp with each round of replication, and, therefore, can indicate the replication history of a T cell population (34). As expected, naive CD4+CD45RA+ T cells have longer telomeres than the memory/activated CD4+CD127+CD45RO+ T cells (Fig. 3⇑C). CD4+CD127− T cells have the shortest telomeres among the three CD4+ T cell subsets. Generally, high cell death rates are associated with effector T cells. Most CD4+CD127− T cells spontaneously died in culture at rates higher than CD4+CD127+CD45RO+ or naive CD4+ T cells (Fig. 3⇑D). In this regard, CD127− T cells expressed BCL-2 (a cell survival-associated molecule) at levels lower than the CD127+ T cells (Fig. 3⇑E). In contrast, the expression of Bcl-xL and MCL-1 (activation and GC-associated BCL-2-related molecules, respectively (35, 36)) was increased in the CD4+CD127− T cells compared with the CD127+ T cells. Thus, the low expression of BCL-2 is in line with its proapoptotic nature, and the high expression of Bcl-xL and MCL-1 correlates with their activation status and tissue tropism, respectively. IL-7 plays positive roles in survival, proliferation, and differentiation of T cells (37). We examined whether the CD4+CD127− T cells identified with the Abs really lost their responsiveness to IL-7. We examined the cell survival and proliferative responses driven by IL-7. Although CD4+CD127+ T cells (naive and CD45RO+ cells) vigorously responded to IL-7 in survival and proliferation, the CD4+CD127− T cells died and poorly responded to IL-7 in both the presence and absence of T cell activation (Fig. 4⇓, A and B). We also examined CXCL13 production in response to IL-7 (Fig. 4⇓C). IL-7 enhanced the CXCL13 production levels of naive T cells and CD127+CD45RO+ cells but not that of CD4+ CD127− T cells which produced CXCL13 at high levels regardless of the stimulation with IL-7. Therefore, these data demonstrate that the CD4+CD127− T cells do not respond to IL-7 and rather die. Before they die, however, CD4+CD127− T cells produce a large amount of CXCL13. The CD4+CD127− T cells lost their sensitivity to IL-7 in cell survival and proliferation. A, The cell survival rates of the T cells with or without activation with PHA were measured by 7-AAD staining/cell size. B, The proliferation abilities of the three CD4+ T cell subsets after T cell stimulation with Abs to CD3 and CD28. A thymidine incorporation assay was performed. C, CXCL13 production capacity upon T cell activation with PHA. All experiments were performed at least three times, and representative (A and C) or combined (B) data are shown. Error bars are the differences of duplicated measurements (A and C) or SEM of the three data sets (B). 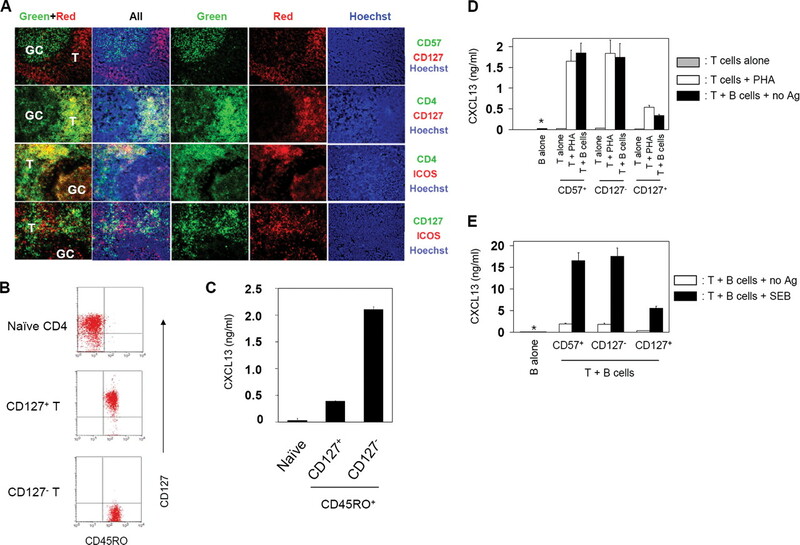 The microenvironmental tissue tropism and other phenotype of CD4+CD127− T cells suggest that they are terminally differentiated effector Th cells in B cell follicles. We examined the B cell-helping activity of the CD4+CD127− T cells and other tonsil CD4+ T cells (Fig. 5⇓A). When cocultured with syngeneic B cells, the CD4+CD127− T cells were most efficient in inducing the production of IgM, IgG, IgA, and IgE. In contrast, naive T cells and CD4+CD45RO+CD127+ T cells were able to only weakly stimulate the production of the Abs by B cells. The CD4+ CD127− T cells are the most efficient T helpers for B cell production of Abs. A, Indicated tonsil CD4+ T cells were cultured with equal numbers of total syngeneic CD19+ B cells for 5 days, and the concentrations of secreted Abs (IgM, pan-IgG, IgA, and IgE) in the culture medium were examined by ELISA. B, Expression of CD40L and ICOS by CD127− T cells at protein and mRNA levels. The percent expression is shown for ICOS, and mean fluorescent intensity (MFI) is shown for the intracellular CD40L expression determined by flow cytometry. Also, RT-PCR was performed to measure them at the mRNA level. The cDNA templates were serially diluted (×5, ×25, and × 125) for semiquantitative measurements. 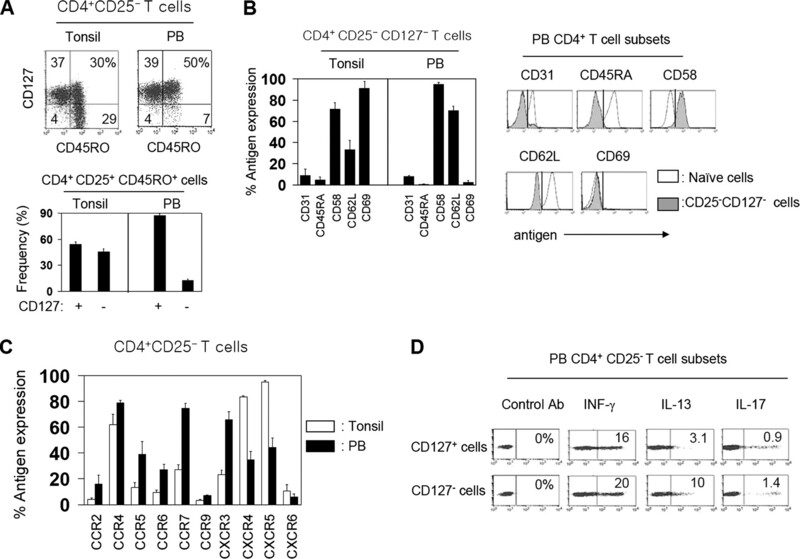 C, CD40L and ICOS are required for CD127− T cell-induced B cell production of Abs. Indicated tonsil CD4+ T cells were cultured with total syngeneic B cells for 5 days in the presence of indicated neutralizing or control Abs, and secretion of Abs (IgM, IgG1, IgA, and IgE) was examined by ELISA. All experiments were performed three times and averages (and SEM) are shown. ICOS and CD40L are costimulatory molecules and have been implicated in GC formation and regulation of humoral immune responses (38, 39, 40, 41). ICOS and CD40L were more highly expressed at protein and mRNA levels by the CD127− T cells than by naive or CD127+ T cells (Fig. 5⇑B). To determine the costimulation molecule requirement for the CD127− T cell-dependent B cell production of Abs, we used neutralizing Abs to CD40L and ICOS (Fig. 5⇑C). A neutralizing Ab to CD40L suppressed the CD4+CD127− T cell-mediated B cell Ig production by ∼80%. Similarly, a neutralizing Ab to ICOS effectively suppressed the CD4+CD127− T cell-mediated B cell Ig production. These data suggest that CD40L and ICOS are required for the B cell-helping function of the CD4+CD127− T cells. We further investigated whether the increased Ab production by the B cells stimulated by CD4+CD127− T cells accompanies increased expression of AID and Ig class switch recombination (Fig. 6⇓). AID is a key enzyme involved in the DNA cleavage for somatic hypermutation and class-switch recombination (42). When B cells and Th cells are stimulated with the superantigen SEB, expression of AID, switch DNA circles, and productive Ig RNA transcripts were induced (Fig. 6⇓, A–C). We found that the CD4+CD127− T cells were most efficient in induction of AID and class switch recombination (indicated by switch DNA circles and productive Ig RNA transcripts) among the three CD4+ T cell subsets (Fig. 6⇓, B and C). Please note that the freshly isolated naive B cells and GC B cells (included as negative and positive controls) showed low background and high levels of class switch recombination, respectively. The CD4+CD127− T cells displayed a B cell-helping activity comparable to the previously characterized CD57+ GC-Th cells (21) in induction of B cell Ig production (Fig. 6⇓D). Overall, these results support that the tonsil CD4+CD127− T cells are highly efficient in induction of the processes required for Ig production in B cells. The CD4+CD127− T cells can induce AID and Ig class switch recombination in B cells. A, RT-PCR analyses of AID expression in naive B cells cocultured with indicated T cells. B, Quantitation of Ig class switch circles in naive B cells cocultured with indicated T cells. 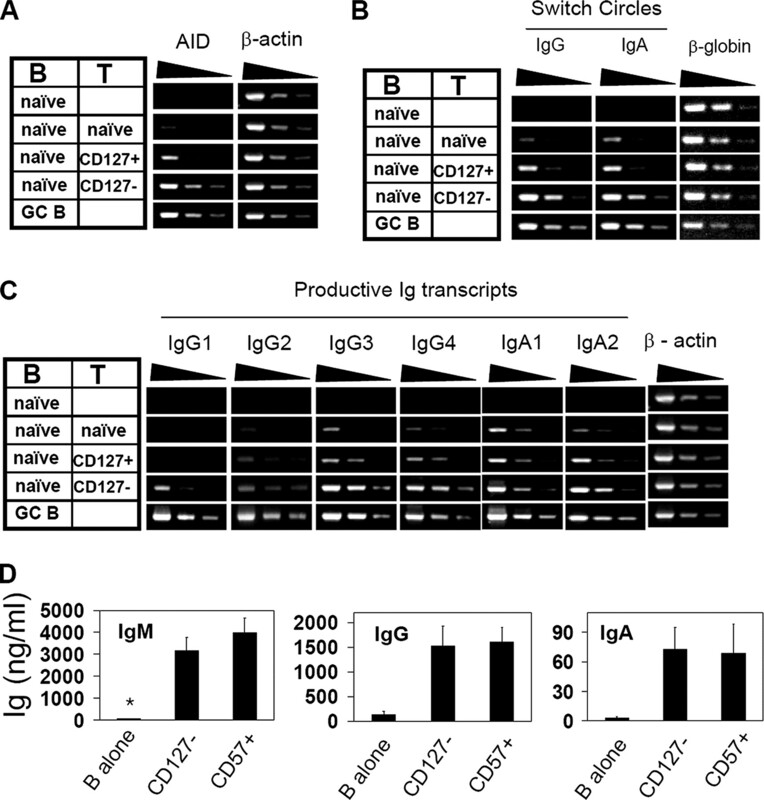 C, Expression of Ig-productive transcripts in naive B cells cocultured with indicated T cells. D, Comparison of tonsil CD4+CD127− T cells and CD4+CD57+ T cells in helping B cells for production of Igs. Indicated tonsil CD4+ T cell subsets were cultured with naive syngeneic B cells for 5 days in the presence of the superantigen SEB to provide an Ag signal, and indicated molecules were detected by RT/genomic PCR or ELISA. All of the PCR templates were serially diluted (×5, ×25, and × 125). All experiments were performed at least three times, and representative (A–C) or combined (D) data are shown. ∗, Barely detectable. In PB, only ∼8% of CD4+CD25− T cells were CD127− T cells, which is considerably lower than in tonsils (Fig. 7⇓A). To find similarities and differences between tonsil and PB non-FOXP3+CD4+CD127− T cells, we examined the surface Ag and cytokine expression phenotype of the PB CD4+CD25−CD127− T cells. PB CD4+CD25−CD127− T cells expressed CD45RO and CD58 (memory/effector cell Ags) but do not express CD45RA, CD31 (naive T cell Ags), and CD69 (an activated cell Ag) (Fig. 7⇓, A and B). PB CD4+CD127− T cells highly expressed CCR5, CXCR3 (a Th1-associated receptor), CCR6 (memory), and CCR7 (circulation and T cell area homing), compared with the tonsil CD4+CD127− T cells (Fig. 7⇓C). In contrast, expression of CXCR4 (a homeostatic homing receptor) and CXCR5 (B cell area homing) was reduced on the PB CD4+CD127− T cells. The PB CD127− T cells contained Th1 (IFN-γ+) cells, Th2 (IL-13+), and Th17 cells (IL-17+ cells) (Fig. 7⇓D). These results suggest that, unlike the tonsil CD4+CD127− T cells, the PB CD4+CD127− T cells are composed of heterogeneous memory/effector T cell subsets. The phenotype of PB non-FOXP3+CD4+CD127− T cells in PB. A, Frequencies of CD4+ CD25− CD127− T cells in PB vs tonsil. B, PB CD4+CD25−CD127− T cells express memory/effector cell-associated Ags. C, Expression of trafficking receptors by the PB CD4+CD25−CD127− T cells. D, Frequencies of Th1 (IFN-γ+), Th2 (IL-13+), and Th17 (IL-17+) cells in the PB CD4+CD25−CD127− cell population. Tonsil CD4+CD25−CD127− T cells are included for comparison (A–C). All experiments were performed three times, and averages (and SEM) or representative data (D) are shown. In an effort to understand the IL-7Rα/CD127 expression by human Th cells specialized in helping B cells, we investigated the phenotype and function of the CD4+ T cell subsets defined by CD127 and CD45RO within the non-FOXP3+ T cell population. We found that the tonsil CD4+CD127− T cells have all of the features of the effector T cells within the B cell-helping T cell lineage and demonstrated the usefulness of CD127 as a marker for these Th cells. We found that, in combination with other surface Ags such as CXCR5 and CD45RO, CD127 allows specific identification of B cell-helping effector CD4+ T cells in tonsils. Moreover, the regulation of CD127 by naive to fully differentiated B cell-helping effector T cells provides insights into how Th cells regulate their responsiveness to IL-7 and effector function during their differentiation. The surface and chemokine receptor phenotype of tonsil CD4+CD127− T cells is interesting in that they highly express CXCR5 (a B cell zone-homing receptor) but express CCR7 at greatly reduced levels (a T cell-zone homing receptor). Coordinated expression of these two receptors regulates the positioning of lymphocytes in secondary lymphoid tissues because of the specific expression of CXCL13 (for CXCR5) in the B cell zones and of CCL19/CCL21 (for CCR7) in T cell zones (29). The selectin molecule CD62L, required for lymphocyte recirculation into lymph nodes, is also down-regulated on the CD4+CD127− T cells. Therefore, the phenotype suggests that these T cells do not circulate the blood-lymphoid system but they would rather position themselves in GCs deep into the B cell areas. Indeed, the immunohistochemistry results demonstrate that almost all of the CD4+ T cells in GCs are CD127−. In contrast, ICOS and CXCR5 are expressed by the majority of memory/activated T cells regardless of their localization in tonsils (Figs. 1⇑ and 2⇑). All of these CD127− T cells are CD69, and they can produce CXCL13, which has the lymphoid tissue and GC-organizing activity (43). CD69 is expressed by activated T cells and down-regulates the expression of sphingosine 1-phosphate receptor (32) for prevention of T cell exit from lymphoid tissues (44). A genome-wide gene expression study determined that CXCL13 is expressed specifically by a GC-Th cell subset (30). Tonsil CD4+CD127− T cells are the T cells that produce CXCL13 potentially for maintaining GCs in a manner similar to follicular dendritic cells (45). Their overall phenotype suggests that the tonsil CD4+CD127− T cells are sessile and engaged in cell-cell interaction with other cells in GCs. This interpretation is strongly supported by their expression of CD57 (HNK-1, ∼40%) and CD58 (LFA-3, ∼75%), adhesion molecules that are implicated in cell-cell interaction (46, 47). In contrast, the CD4+ CD127− T cells lack the expression of CD31, CD45RA, and lymphotoxin-α, the Ags specifically expressed by naive CD4+ T cells in humans (48, 49), demonstrating their nature as memory/effector T cells. By definition, effector T cells should be highly efficient in performing specialized functions. The tonsil CD4+CD127− T cells are remarkably efficient in helping B cells to produce all subsets of Abs (IgM, IgG, IgA, and IgE) (Fig. 5⇑). This nonselective nature of B cell-helping activity in terms of Ig isotypes is considered an important feature of basic B cell-helping effector T cells. Based mainly on in vitro data, it has been postulated that Th2 cells would be a major effector T cell subset providing B cell help (50, 51). However, Th2 cells do not express the B cell zone-homing receptor CXCR5 (52), and, thus, cannot migrate toward B cells to stimulate them. In addition, Th2 cells do not induce Ab class switch to all subsets of Abs but selectively induce the production of subsets of Abs (IgG4 and IgE) in humans through IL-4. Moreover, IL-4 is not essential for T-dependent Ab responses (53). In contrast, CD127− T cells are nonpolarized T cells, and, thus, can induce the Ig class switch to all isotypes of Abs without any preference. The Ab production profile induced by the tonsil CD4+CD127− T cells is characterized by high IgG/IgM, intermediate IgA and low IgE, which is a typical serum Ab profile in healthy people. As potential effector/costimulatory molecules, we examined CD40L and ICOS, which are required to maintain humoral immunity in humans and mice (38, 39, 40, 41, 54). 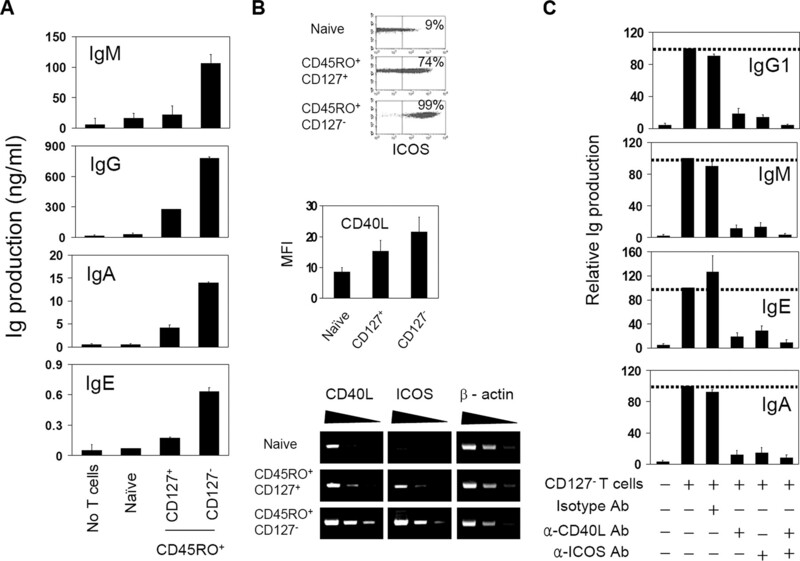 Blockade of CD40L or ICOS effectively incapacitated the B cell-helping ability of CD127− T cells (Fig. 5⇑), suggesting that CD4+CD127− T cells need these molecules to induce B cell production of Abs. CD127− T cells are more efficient than CD127+ T cells in inducing AID expression required for Ig gene class switch recombination (Fig. 6⇑). In this study, we stimulated the T cells to drive T cell activation, a situation where even naive T cells can induce class switch recombination at certain levels due to the activation signal. Even in this situation, CD4+CD127− T cells were more efficient than other T cells in class switch recombination. Telomeres become shorter as eukaryotic cells divide unless the telomerase is expressed to prolong the shortened telomeres (33). Effector T cells typically have short telomeres (55), which is the evidence of their proliferation history. Consistently, CD4+CD127− T cells have the shortest telomeres among the tonsil CD4+ T cell subsets, reflecting their extensive cell division history before they become the terminally differentiated effector cells. Although effector T cells are highly efficient in their function as discussed above, they usually do not proliferate and are programmed to undergo cell death (56). In this regard, the proapoptotic and nonproliferative nature of CD4+CD127− tonsil T cells also supports that they are terminally differentiated effector T cells. Blocking the death of effector T cells by deleting death receptors or overexpressing cell survival molecules can induce lymphoproliferative diseases (57). Therefore, it is possible that the programmed death of CD4+CD127− tonsil T cells would help terminate the humoral immune responses in GCs. The loss of an IL-7Rα chain specifically by these effector T cells would program them to die rather than survive and expand in response to IL-7 upon completion of their effector function. Although both the PB and tonsil (non-FOXP3+) CD4+CD127− T cells are memory/effector cells, they are different in many aspects. The CD4+CD127− T cells are rare in PB and appear to be highly heterogeneous containing various memory/effector T cells such as Th1, CXCR5+ T cells, Th2, and Th17 cells. The PB non-FOXP3+CD4+CD127− T cells highly express CCR7 and CD62L, the trafficking receptors to circulate the T cell areas of secondary lymphoid tissues and the blood. They also highly express polarized memory/effector cell-associated chemokine receptors such as CCR4, CCR5, CCR6, and CXCR3. Unlike the tonsil CD127− T cells, PB CD4+CD127− T cells are not activated based on the CD69 expression. Taken together, the available information suggests that, unlike the more homogeneous and sessile tonsil CD4+CD127− T cells, the PB CD4+CD127− T cells are composed of many different circulating memory/effector T cell subsets. To summarize, we found biologically interesting features of the tonsil non-FOXP3+CD4+CD127− T cells, which include 1) loss of IL-7Rα and the responsiveness to IL-7; 2) high expression of CXCR5 but reduced expression of CCR7 and CD62L; 3) high expression of effector T cell adhesion molecules; 4) specific localization in GC; 5) high activities in helping B cells and inducing Ig class switch recombination; 6) production of lymphoid tissue-organizing CXCL13; 7) short telomeres; 8) nonproliferative nature; and 9) being proapoptotic. Taken together, our study provides the evidence that the CD4+CD127− T cells in the B cell-dominant lymphoid tissue tonsils are terminally differentiated effector T cells specialized in helping B cells. We thank S. G. Kang, J. H. Lee, and C. W. Wang (Kim Laboratory, Purdue University) for their helpful input. ↵1 This work was supported, in part, from grants from the American Heart Association, National Institutes of Health-National Institute of Allergy and Infectious Diseases (AI063064), and the Crohn’s and Colitis Foundation of America (to C.H.K.). ↵3 Abbreviations used in this paper: BCL, B cell leukemia/lymphoma; GC, germinal center; PB, peripheral blood; AID, activation-induced cytidine deaminase; SEB, staphylococcal enterotoxin B; 7-AAD, 7-aminoactinomycin D; MCL, myeloid cell leukemia. Peschon, J. J., P. J. Morrissey, K. H. Grabstein, F. J. Ramsdell, E. Maraskovsky, B. C. Gliniak, L. S. Park, S. F. Ziegler, D. E. Williams, C. B. Ware, et al 1994. Early lymphocyte expansion is severely impaired in interleukin 7 receptor-deficient mice. J. Exp. Med. 180: 1955-1960.
von Freeden-Jeffry, U., P. Vieira, L. A. Lucian, T. McNeil, S. E. Burdach, R. Murray. 1995. 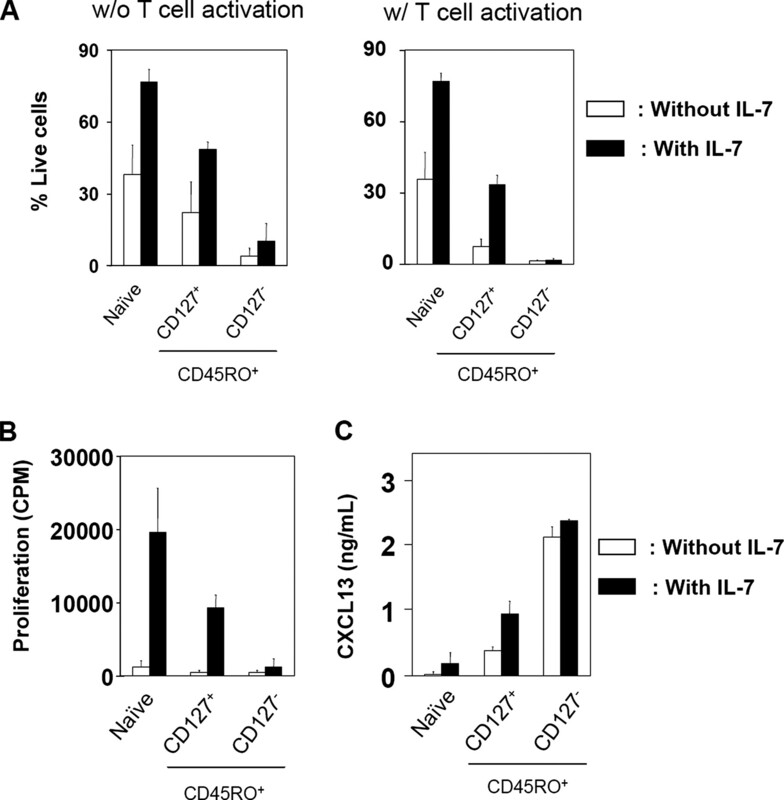 Lymphopenia in interleukin (IL)-7 gene-deleted mice identifies IL-7 as a nonredundant cytokine. J. Exp. Med. 181: 1519-1526. Kondrack, R. M., J. Harbertson, J. T. Tan, M. E. McBreen, C. D. Surh, L. M. Bradley. 2003. Interleukin 7 regulates the survival and generation of memory CD4 cells. J. Exp. Med. 198: 1797-1806. Johnson, S. E., N. Shah, A. Panoskaltsis-Mortari, T. W. LeBien. 2005. Murine and human IL-7 activate STAT5 and induce proliferation of normal human pro-B cells. J. Immunol. 175: 7325-7331. Schluns, K. S., W. C. Kieper, S. C. Jameson, L. Lefrancois. 2000. Interleukin-7 mediates the homeostasis of naive and memory CD8 T cells in vivo. Nat. Immunol. 1: 426-432. Tan, J. T., E. Dudl, E. LeRoy, R. Murray, J. Sprent, K. I. Weinberg, C. D. Surh. 2001. IL-7 is critical for homeostatic proliferation and survival of naive T cells. Proc. Natl. Acad. Sci. USA 98: 8732-8737. Chazen, G. D., G. M. Pereira, G. LeGros, S. Gillis, E. M. Shevach. 1989. Interleukin 7 is a T-cell growth factor. Proc. Natl. Acad. Sci. USA 86: 5923-5927. Boise, L. H., A. J. Minn, C. H. June, T. Lindsten, C. B. Thompson. 1995. Growth factors can enhance lymphocyte survival without committing the cell to undergo cell division. Proc. Natl. Acad. Sci. USA 92: 5491-5495. Vella, A. T., S. Dow, T. A. Potter, J. Kappler, P. Marrack. 1998. Cytokine-induced survival of activated T cells in vitro and in vivo. Proc. Natl. Acad. Sci. USA 95: 3810-3815. Smyth, M. J., Y. Norihisa, J. R. Gerard, H. A. Young, J. R. Ortaldo. 1991. IL-7 regulation of cytotoxic lymphocytes: pore-forming protein gene expression, interferon-γ production, and cytotoxicity of human peripheral blood lymphocytes subsets. Cell. Immunol. 138: 390-403.
van der Vliet, H. J., N. Nishi, Y. Koezuka, B. M. von Blomberg, A. J. van den Eertwegh, S. A. Porcelli, H. M. Pinedo, R. J. Scheper, G. Giaccone. 2001. Potent expansion of human natural killer T cells using α-galactosylceramide (KRN7000)-loaded monocyte-derived dendritic cells, cultured in the presence of IL-7 and IL-15. J. Immunol. Methods 247: 61-72. Matsue, H., P. R. Bergstresser, A. Takashima. 1993. Keratinocyte-derived IL-7 serves as a growth factor for dendritic epidermal T cells in mice. J. Immunol. 151: 6012-6019. Ziegler, S. F., Y. J. Liu. 2006. Thymic stromal lymphopoietin in normal and pathogenic T cell development and function. Nat. Immunol. 7: 709-714. Sudo, T., S. Nishikawa, N. Ohno, N. Akiyama, M. Tamakoshi, H. Yoshida, S. Nishikawa. 1993. Expression and function of the interleukin 7 receptor in murine lymphocytes. Proc. Natl. Acad. Sci. USA 90: 9125-9129. Kaech, S. M., J. T. Tan, E. J. Wherry, B. T. Konieczny, C. D. Surh, R. Ahmed. 2003. Selective expression of the interleukin 7 receptor identifies effector CD8 T cells that give rise to long-lived memory cells. Nat. Immunol. 4: 1191-1198. Kim, H. R., M. S. Hong, J. M. Dan, I. Kang. 2006. Altered IL-7Rα expression with aging and the potential implications of IL-7 therapy on CD8+ T-cell immune responses. Blood 107: 2855-2862. Paiardini, M., B. Cervasi, H. Albrecht, A. Muthukumar, R. Dunham, S. Gordon, H. Radziewicz, G. Piedimonte, M. Magnani, M. Montroni, et al 2005. Loss of CD127 expression defines an expansion of effector CD8+ T cells in HIV-infected individuals. J. Immunol. 174: 2900-2909. Seddiki, N., B. Santner-Nanan, J. Martinson, J. Zaunders, S. Sasson, A. Landay, M. Solomon, W. Selby, S. I. Alexander, R. Nanan, et al 2006. Expression of interleukin (IL)-2 and IL-7 receptors discriminates between human regulatory and activated T cells. J. Exp. Med. 203: 1693-1700. Liu, W., A. L. Putnam, Z. Xu-Yu, G. L. Szot, M. R. Lee, S. Zhu, P. A. Gottlieb, P. Kapranov, T. R. Gingeras, B. Fazekas de St. Groth, et al 2006. CD127 expression inversely correlates with FoxP3 and suppressive function of human CD4+ T reg cells. J. Exp. Med. 203: 1701-1711. McHeyzer-Williams, L. J., L. P. Malherbe, M. G. McHeyzer-Williams. 2006. Helper T cell-regulated B cell immunity. Curr. Top. Microbiol. Immunol. 311: 59-83. Kim, C. H., L. S. Rott, I. Clark-Lewis, D. J. Campbell, L. Wu, E. C. Butcher. 2001. Subspecialization of CXCR5+ T cells: B helper activity is focused in a germinal center-localized subset of CXCR5+ T cells. J. Exp. Med. 193: 1373-1381. Schaerli, P., K. Willimann, A. B. Lang, M. Lipp, P. Loetscher, B. Moser. 2000. CXC chemokine receptor 5 expression defines follicular homing T cells with B cell helper function. J. Exp. Med. 192: 1553-1562. Breitfeld, D., L. Ohl, E. Kremmer, J. Ellwart, F. Sallusto, M. Lipp, R. Forster. 2000. Follicular B helper T cells express CXC chemokine receptor 5, localize to B cell follicles, and support immunoglobulin production. J. Exp. Med. 192: 1545-1552. Rasheed, A. U., H. P. Rahn, F. Sallusto, M. Lipp, G. Muller. 2006. Follicular B helper T cell activity is confined to CXCR5hiICOShi CD4 T cells and is independent of CD57 expression. Eur. J. Immunol. 36: 1892-1903. Lim, H. W., H. E. Broxmeyer, C. H. Kim. 2006. Regulation of trafficking receptor expression in human forkhead box P3+ regulatory T cells. J. Immunol. 177: 840-851. Lim, H. W., P. Hillsamer, C. H. Kim. 2004. Regulatory T cells can migrate to follicles upon T cell activation and suppress GC-Th cells and GC-Th cell-driven B cell responses. J. Clin. Invest. 114: 1640-1649. Lim, H. W., P. Hillsamer, A. H. Banham, C. H. Kim. 2005. Cutting edge: direct suppression of B cells by CD4+CD25+ regulatory T cells. J. Immunol. 175: 4180-4183. Weckert, H. A., J. A. Hughes, E. M. Benson, I. S. Dunn. 2000. Quantifiable analysis of human immunoglobulin heavy chain class-switch recombination to all isotypes. J. Immunol. Methods 233: 141-158. Hardtke, S., L. Ohl, R. Forster. 2005. Balanced expression of CXCR5 and CCR7 on follicular T helper cells determines their transient positioning to lymph node follicles and is essential for efficient B-cell help. Blood 106: 1924-1931. Kim, C. H., H. W. Lim, J. R. Kim, L. Rott, P. Hillsamer, E. C. Butcher. 2004. Unique gene expression program of human germinal center T helper cells. Blood 104: 1952-1960. Elias, C. G., 3rd, J. P. Spellberg, B. Karan-Tamir, C. H. Lin, Y. J. Wang, P. J. McKenna, W. A. Muller, M. M. Zukowski, D. P. Andrew. 1998. Ligation of CD31/PECAM-1 modulates the function of lymphocytes, monocytes and neutrophils. Eur. J. Immunol. 28: 1948-1958. Shiow, L. R., D. B. Rosen, N. Brdickova, Y. Xu, J. An, L. L. Lanier, J. G. Cyster, M. Matloubian. 2006. CD69 acts downstream of interferon-α/β to inhibit S1P1 and lymphocyte egress from lymphoid organs. Nature 440: 540-544. Stewart, S. A., R. A. Weinberg. 2006. Telomeres: cancer to human aging. Annu. Rev. Cell. Dev. Biol. 22: 531-557. Harley, C. B., A. B. Futcher, C. W. Greider. 1990. Telomeres shorten during ageing of human fibroblasts. Nature 345: 458-460. Rassidakis, G. Z., R. Lai, T. J. McDonnell, F. Cabanillas, A. H. Sarris, L. J. Medeiros. 2002. Overexpression of Mcl-1 in anaplastic large cell lymphoma cell lines and tumors. Am. J. Pathol. 160: 2309-2310. Zhang, N., Y. W. He. 2005. The antiapoptotic protein Bcl-xL is dispensable for the development of effector and memory T lymphocytes. J. Immunol. 174: 6967-6973. Fry, T. J., C. L. Mackall. 2005. The many faces of IL-7: from lymphopoiesis to peripheral T cell maintenance. J. Immunol. 174: 6571-6576. Allen, R. C., R. J. Armitage, M. E. Conley, H. Rosenblatt, N. A. Jenkins, N. G. Copeland, M. A. Bedell, S. Edelhoff, C. M. Disteche, D. K. Simoneaux, et al 1993. CD40 ligand gene defects responsible for X-linked hyper-IgM syndrome. Science 259: 990-993. Aruffo, A., M. Farrington, D. Hollenbaugh, X. Li, A. Milatovich, S. Nonoyama, J. Bajorath, L. S. Grosmaire, R. Stenkamp, M. Neubauer, et al 1993. The CD40 ligand, gp39, is defective in activated T cells from patients with X-linked hyper-IgM syndrome. Cell 72: 291-300. Bossaller, L., J. Burger, R. Draeger, B. Grimbacher, R. Knoth, A. Plebani, A. Durandy, U. Baumann, M. Schlesier, A. A. Welcher, et al 2006. ICOS deficiency is associated with a severe reduction of CXCR5+CD4 germinal center Th cells. J. Immunol. 177: 4927-4932. Warnatz, K., L. Bossaller, U. Salzer, A. Skrabl-Baumgartner, W. Schwinger, M. van der Burg, J. J. van Dongen, M. Orlowska-Volk, R. Knoth, A. Durandy, et al 2006. Human ICOS deficiency abrogates the germinal center reaction and provides a monogenic model for common variable immunodeficiency. Blood 107: 3045-3052. Honjo, T., H. Nagaoka, R. Shinkura, M. Muramatsu. 2005. AID to overcome the limitations of genomic information. Nat. Immunol. 6: 655-661. Ansel, K. M., V. N. Ngo, P. L. Hyman, S. A. Luther, R. Forster, J. D. Sedgwick, J. L. Browning, M. Lipp, J. G. Cyster. 2000. A chemokine-driven positive feedback loop organizes lymphoid follicles. Nature 406: 309-314. Matloubian, M., C. G. Lo, G. Cinamon, M. J. Lesneski, Y. Xu, V. Brinkmann, M. L. Allende, R. L. Proia, J. G. Cyster. 2004. Lymphocyte egress from thymus and peripheral lymphoid organs is dependent on S1P receptor 1. Nature 427: 355-360. Cyster, J. G., K. M. Ansel, K. Reif, E. H. Ekland, P. L. Hyman, H. L. Tang, S. A. Luther, V. N. Ngo. 2000. Follicular stromal cells and lymphocyte homing to follicles. Immunol. Rev. 176: 181-193. Crawford, K., A. Stark, B. Kitchens, K. Sternheim, V. Pantazopoulos, E. Triantafellow, Z. Wang, B. Vasir, C. E. Larsen, D. Gabuzda, et al 2003. CD2 engagement induces dendritic cell activation: implications for immune surveillance and T-cell activation. Blood 102: 1745-1752. Nielsen, M., J. Gerwien, C. Geisler, C. Ropke, A. Svejgaard, N. Odum. 1998. MHC class II ligation induces CD58 (LFA-3)-mediated adhesion in human T cells. Exp. Clin. Immunogenet. 15: 61-68. Ashman, L. K., G. W. Aylett. 1991. Expression of CD31 epitopes on human lymphocytes: CD31 monoclonal antibodies differentiate between naive (CD45RA+) and memory (CD45RA−) CD4-positive T cells. Tissue Antigens 38: 208-212. Ohshima, Y., L. P. Yang, M. N. Avice, M. Kurimoto, T. Nakajima, M. Sergerie, C. E. Demeure, M. Sarfati, G. Delespesse. 1999. Naive human CD4+ T cells are a major source of lymphotoxin α. J. Immunol. 162: 3790-3794. Stevens, T. L., A. Bossie, V. M. Sanders, R. Fernandez-Botran, R. L. Coffman, T. R. Mosmann, E. S. Vitetta. 1988. Regulation of antibody isotype secretion by subsets of antigen-specific helper T cells. Nature 334: 255-258. Maggi, E., G. Del Prete, D. Macchia, P. Parronchi, A. Tiri, I. Chretien, M. Ricci, S. Romagnani. 1988. Profiles of lymphokine activities and helper function for IgE in human T cell clones. Eur. J. Immunol. 18: 1045-1050. Kim, C. H., L. Rott, E. J. Kunkel, M. C. Genovese, D. P. Andrew, L. Wu, E. C. Butcher. 2001. Rules of chemokine receptor association with T cell polarization in vivo. J. Clin. Invest. 108: 1331-1339. Kuhn, R., K. Rajewsky, W. Muller. 1991. Generation and analysis of interleukin-4 deficient mice. Science 254: 707-710. Hamann, D., S. Kostense, K. C. Wolthers, S. A. Otto, P. A. Baars, F. Miedema, R. A. van Lier. 1999. Evidence that human CD8+CD45RA+CD27− cells are induced by antigen and evolve through extensive rounds of division. Int. Immunol. 11: 1027-1033. Sprent, J., D. F. Tough. 2001. T cell death and memory. Science 293: 245-248. Watanabe-Fukunaga, R., C. I. Brannan, N. G. Copeland, N. A. Jenkins, S. Nagata. 1992. Lymphoproliferation disorder in mice explained by defects in Fas antigen that mediates apoptosis. Nature 356: 314-317.